If you have been reading this blog for a while you may know two things about me. A.) That I am the organizer of the Merritt Ice Fishing Derby on behalf of the Nicola Valley Fish & Game Club. B.) I love ice fishing almost as much as summer fishing on a lake with my boat. With that background it may not come as a surprise to you that I am exited at the fact that a layer of ice covers most lakes in the Nicola Valley. While some lakes in the lower elevations still lack the ice thickness to be safe walking on it, other lakes in the higher elevations are already experiencing ice fishing action. That is good news and there is more to follow. More small lakes that previously have been closed to ice fishing are now open to ice fishing. That makes the Nicola – Thomson region into the provinces ice fishing capital. 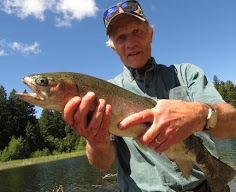 In upcoming articles I will discuss tackle and tactics of the successful rainbow trout ice fisherman. I hope you get some pictures or tell us more stories about icefishing this year. I won't be able to go because I'm overseas on a job. I'd love to hear about the sport fishing tackle your using and the fish your aiming for. Thanks for the great posts as always!